Please be patient, guys. The missus broke her foot and ankle again on Thursday and I have turned into t full time house husband. Got 00s of photos to upload too. Bear with me. I will get this thread back on track directly! Wandle1 - All too true when you say "Not much compares to the peace and solitude we used to have." I now, looking back, realize just how lucky we were in Cornwall at that time and that it is mostly gone, for one reason or another. Just the memories left. You'd need a friendly landowner, plenty of money and lots of fencing (if geographically possible, which it often isn't) to recreate and secure the low pressured gems we used to be lucky to fish. Wow,again a fantastic photo of what looks a very nice place......your most probably right about the lutra as well..
Wandle1 - The last I heard (online, as I am "up country" now) the property had changed hands and the new owner did not want anglers coming and going so it is now out of bounds. It had Commons mainly, to around mid twenties in the early 1990's and was a splendid secluded location. More often than not I, or we if I went with a friend, had the place to ourselves, mid-week. Nigel Britton's friend Steve Westbury (now in Canada) did a good write-up called "Tales of Trencrom" under the pseudonym "Carpsava." If you paste: http://webspace.webring.com/people/kw/waterwize/carpstories.html into your browser you can read it together with stories of College Reservoir and Bilberry Pool. I have seen it described by another Cornish exile as: "a real gem hidden away in a little valley in the Cornish moorland. It's actually two small ponds, about an acre and a half apiece......... Trencrom was a magical little place, a rare piece of seclusion in a very overpopulated little island." According to Steve and Nigel they loved sweet baits especially Tutti's, I used Tropicanos and did OK. I remember Gary Thomas (who fished College at the time) saying fondness of sweet baits was a particular trait of Commons. Unfortunately a stream runs through and Otters may have found and cleared it out now? The photo below is from the first day I ever fished the place (29/06/90.) They were crashing all over when we arrived, a "cannot go wrong" type of day though not often repeated! I had this long list of waters,literally that i intended to fish one by one..all of them in Cornwall ,this was my plan ..
One night,last winter during a howling storm I once again revisited my list,after a short while I realised most of these places were lost to angling,so I screwed up this list and threw it into my open fire..
My problem is I don't wish to fish up country and Im only interested in Cornwall carping and over the border into Devon..
Not much compares to the peace and solitude we used to have.. It's quiet up there & with a stream running through the pools & an estuary nearby - I can't believe that old lutra hasn't popped by for a visit or two - & in a small shallow pool there's only going to be one winner. Yeah - great stuff Ken, loving these write ups; especially the salamander & Roche stuff & it's great to see pics of of some "old friends"
Agreed,its fantastic ,proper Cornish carp fishing history ..
also....now i`m remembering a few things.Ken wrote a really good article called `Rejuvenation at Rashleigh`or similar..well of course this fired me up and i especially wanted to catch `Busted tail`so i joined for the year Roche AC..
Ken this thread has lot of feelings , your history of fishing is immense well documented and to share it with us is outstanding and very generous. What followed piled disaster upon disaster. In 1993 the local council decided to de-silt the lake using heavy plant. The fish were netted and kept in the council's own pond while the diggers and bucket dredgers did their worst. Most of the swims were destroyed, the trees cut down, a stupid artificial island constructed. When they brought the fish back, with them came thousands of small roach and rudd to compete with the 28-30 carp that were restocked. The soul of the lake was lost completely, but as if this desecration was not enough, a well organised gang of thieves came down and netted the lake again only this time it wasn't for the council it was to line their own pockets. *******s! What is the most sad thing about this entire episode is that Salamander's carp had for once bred successfully and some of the offspring grew very quickly to become mid to upper doubles. Given the way their parents had thrived in the lake, I am sure several of their kids would have gone on to make thirty. This is the last Salamander fish I caught. It weighs 17lb and as far as I know this was the only time it was ever landed. It too disappeared in the back of the thieves' lorry. Daddy achieved a maximum weight just prior to the theft, caught by young Andrew, a very accomplished angler who in now an angling coach. 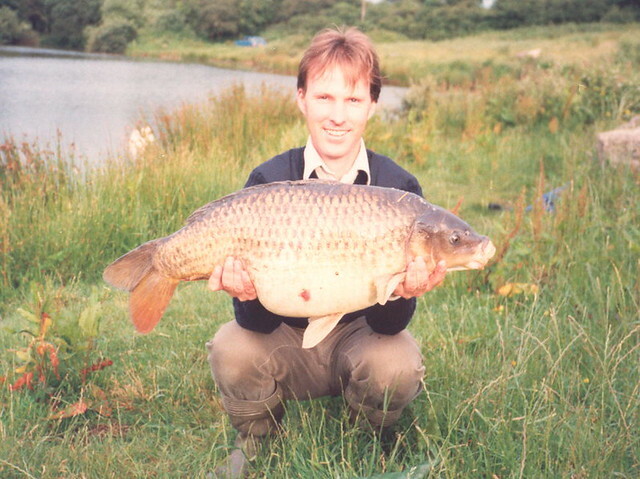 Twenty years ago he was a mere slip of a lad, but he knew how to catch carp. Sadly Daddy had been damaged again, this time loosing the top lobe of his tail Poor old soul. 30. Andrew with Big Daddy at 34lb plus. So that is the story of Cornwall's equivalent of Colne Mere's Black Mirror. Not as controversial in many ways, but a sad loss to the county's carping history. I like to dream that Daddy is alive and well and enjoying a well earned retirement. Sadly I know this not to be true, for I know he has lost loads of weight, most of his tail and he looks like he'd been dropped from a plane without a parachute. I also know who nicked him and where he lives and it's a turgid bog of a place with as much atmosphere as a the inside of a dustbin, a sad ending for such a magnificent fish. I have so many happy memories of that great fish, as I am certain do Jason and Alan who pioneered Colne Mere in much the same way as Ian and myself pioneered Salamander. Big Daddy meant a lot to me so I am glad I caught him when he was whole again, full tail, lovely big body and the power of the man after whom he is named. Finally: Throughout this I have referred to Big Daddy in the masculine when in fact he was a she as Lou Reed would say! Lots more to come, including College just for you, Peter. News about the little Cornish lake was gradually seeping out, and Big Daddy had acquired a rather unwanted status as a target for for SW carpers and even for those from further afield. There were now three or four twenties in the lake as well as the black backed mirror which Ian and I had both seen but never caught. It looked like a coal barge when spotted swimming with the others, as black as your hat. I really wanted that fish, so was chuffed to bits when I finally caught this 'insignificant' Cornish double! 26. The Cornish Black Mirror. Sadly we had plenty of real numpty's join in the free for all too. I knew it was only a matter of time before all this was lost so I decided to have one last go for Big Daddy to try and catch him at thirty plus. I succeeded and he weighed 33lb 8oz and do you know what? It was such an anti-climax, almost an insult to the old boy, that I didn't even take a trophy shot, just one on the mat. Somehow it didn't seem right. It's late May 1987 and I was at the lake looking for fish. I spotted a small group not far from the diner plate tight into the bank under one of the willows. Creeping into the shade I lowered the bait with a three-bait stringer tied to the hook down the edge with the float almost touching the bank. The fish were so close in I could have touched them with my rod tip. I kept my eyes glued on the hookbait and out of the corner of my eye saw Daddy waddling along so close it I swear he was rubbing his left flank along the bank. I saw his mouth open, he turned and bolted and that was when I realised he had picked up the bait. All hell broke loose. Line poured off the reel but then stopped. I pulled back but all was solid; he had weeded me up and in addition to that the line was also entangled in the overhanging branches of the willow! By pure good fortune a guy who has just started fishing Salamander that year was walking the lake. I thrust the rod into his hand and started to strip off. I was down to my pants when Paul said that the fish was free again so I grabbed the rod off him and started playing the fish only for the line to catch in the branches of the willow again. I was shaking like one of the leaves on that bloody willow by now, convinced that I was going to loose the fish. In desperation I prepared to go in for him but then by pure luck the line pulled free and the fish wallowed on the surface. I reached out with the net and my heart stopped as this big lump slid over the cord. Phew! We laid the fish down in the long grass and I got out the scales, zeroed them with the wet sling on the hook and then hoisted Daddy up. It watched in amazement as the needle swung round into the purple sector, finally settling on 26lb 14oz at the time my second heaviest fish. ***** You will note that the lower lobe of the tail is broken clean off in this photo. It didn't happen during my capture so I guess some one else must have caught the fish prior to the above encounter. It didn't detract from my enjoyment in any way but I hoped the rays might grow back in the years to come, which, indeed they did and for a while Daddy became whole again. How do I know this? Well despite my promise to Daddy that I would not deliberately fish for him again, sadly the old boy had developed a taste for bait and started growing at an alarming rate passing the thirty pound mark. However, I was after other fish including our very own true Black Mirror, only a meagre "Cornish double" as some kind poster has pointed out but a much sought-after fish for all that. By now there were several twenties in the lake as well as a thirty and Salamander was fast acquiring a country wide reputation. The dinner plate was plain to see even in low light and I often spotted fish feeding on it from within the branches of the spotting tree. 22. Up one of the spotting trees. BD was one of the regulars at the fast food joint so I decided it was time to stop feeding them and start catching them. 23. BD and a friend call in for dinner. Another area that Daddy liked to frequent was under Quasimodo's Bush. Quasimodo was my nickname for a most peculiar shaped carp with a very deformed spine, so much so that it only seemed able to swim in left-turning circles. This fish was in almost permanent residence under a set of bushes at the far and of the lake and the other fish seemed almost as if they were scared of the poor old creature as it was a real loner. The only fish I ever saw Quasi in company with was Big Daddy. Most odd. Odder still was the fact that no matter how often I fished to that area I never caught either fish from the bush, though Daddy was happy to oblige in other areas of the lake! Though we did more nights now than was previously the case, the number of fish I caught while stalking outnumbered those caught on the carp fishing method by 3:1. Float fishing or link ledgering was more exciting too!